News :: Being a Balance Super Star - Glide Bikes - Balance Bikes for 18 months to 10 years old! If you haven’t heard by now, we’ll fill you in, balance bikes are the best way to get your child up to par on bike riding. The logic just makes sense, why would you teach child how to pedal using training wheels when the difficult part of transitioning to a two wheel bike is knowing how to balance. That’s where balance bikes come in. Instead of using your toddling years to become a proficient pedal-er, a balance bike allows your kid to become a balance super star! What are the benefits of being a balance super star? Because balance bikes are low to the ground and lightweight kids can easily move the bike, manipulating it, and increasing their abilities in balance and bike riding! If they feel uncomfortable at any time they can simply stop the bike by either using the child-sized handbrake located on the handlebars or by just standing up, or placing their feet on the ground. Your child will be able to build up confidence more quickly, by taking small steps towards balancing a bike in a shorter amount of time. After they’ve developed their balance, and are old enough to get on a proper pedal two wheeler, there is no tears, no drama. They just simply start pedaling, and you’re done! A lot of people think "it’s too simple" and they are left wondering if it even works, or more often, “what’s the point?” Although it’s true that some children might transition from training wheels to traditional two wheel bikes with no fuss many, if not most, children struggle with the initial balancing act that bike riding requires. This leads to scuffed knees, sobbing, and worse, fear of trying again! 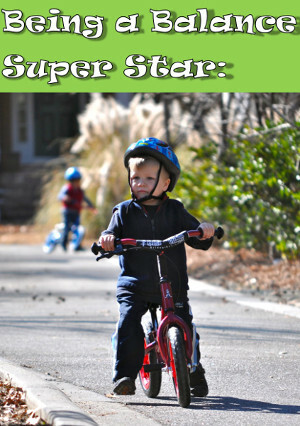 With a balance bike the fear is eliminated, because they’ve already become a balance super star!